This is the first of a series of articles where i will show you how integrate Delphi Prism and the SQL Server CLR support. SQL Server (Since version 2005) allow you to create database objects using the integration with the .NET Framework common language runtime (CLR). this mean which you can create a .net assembly and then call the methods defined in your class directly from SQL Server like any SQL Object, you can create Scalar-valued user-defined functions (scalar UDFs), Table-valued user-defined functions (TVFs), User-defined procedures (UDPs) and User-defined triggers. 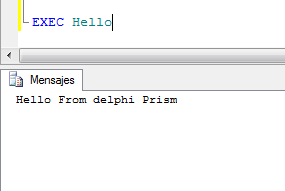 today we will see how to create CLR Stored Procedures from Delphi prism. 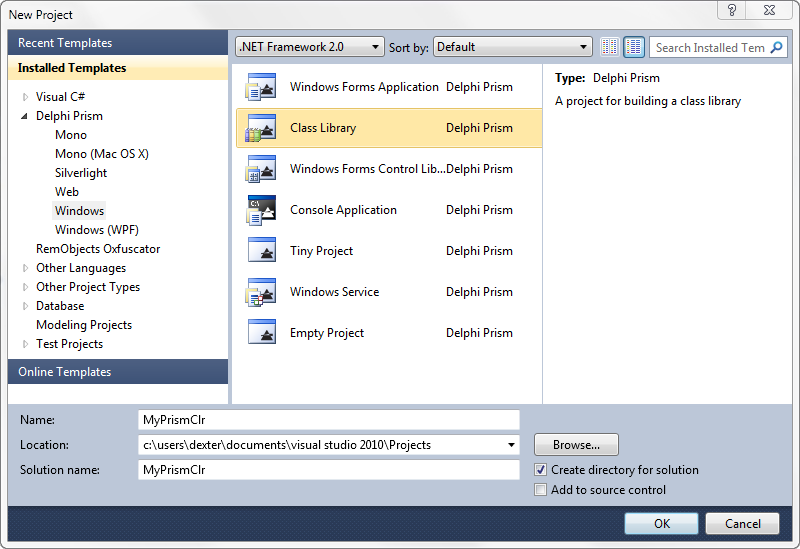 Ok, first you need to create a new Delphi prism project of class library type. Now before to define the code to be accessed from SQL Server you must know the requirements of the CLR stored procedures. 1) In the common language runtime (CLR), stored procedures are implemented as public static methods on a class in a Microsoft .NET Framework assembly. 2) you must include the Microsoft.SqlServer.Server namespace in your uses list. 4) all the methods must have the [Microsoft.SqlServer.Server.SqlProcedure()] attribute, this attribute tells to Visual Studio compiler that this is a stored procedure for SQL Server. Check this sample declaration for a Delphi prism class which contains CLR stored procedures. The CLR Stored Procedures can return information in several ways. This includes output parameters, tabular results, and messages. class method MyClass.GetSqlVersion(out Intvalue: SqlInt32;out Strvalue: SqlString); //look the types used, are SQL Server types remember the requirements? var  connection: SqlConnection := new SqlConnection('context connection=true'); //this is cool in this line you are using the current connection instance of the caller client, so you don't need connect to the SQL server. one of the overload versions of the SqlContext.Pipe.Send method allow you to send messages directly to the client or current output consumer. You can return directly to the client a result set. this sample method returns a list of the tables and rows in the current database. // send the result set to the client directly. You can also create a result set on the fly and return to the client the results. this sample method create a record with 4 columns(fields). // Create a record object with 4 columns that represents an individual row, including it's metadata. // Send the record to the client. Ok, now we have our code, we need deploy in the SQL Server. first you must activate CLR support in the SQL server, because is disabled by default. execute this sentence to activate the CLR support. Now we need register our assembly using the CREATE ASSEMBLY sentence. 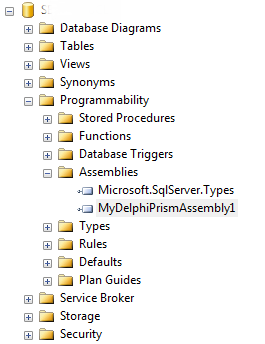 if all it’s ok you must can view the registered assembly under the assemblies folder of your SQL Management Studio. next we need create and register every procedure of our assembly. see this sample, in this sentence we are creating a SQL Server stored procedure called hello where the implementation is defined in our assembly. and when you execute this stored procedure the result will be something like this. finally this is how you must register a stored procedure with output parameters. This is the full source-code of the Delphi prism class used in this article. // Create a record object that represents an individual row, including it's metadata. the samples showed in this article are very simple, and just pretend show the basic functionalities, you can find many ways to apply this to your own project. personally I use SQL CLR in real life applications to calculate hashes, encrypt data and make complex calculations. Categories: .Net, Delphi Prism, SQL CLR, Sql Server | Tags: .Net, Delphi Prism, SQL CLR, Sql Server | Permalink.